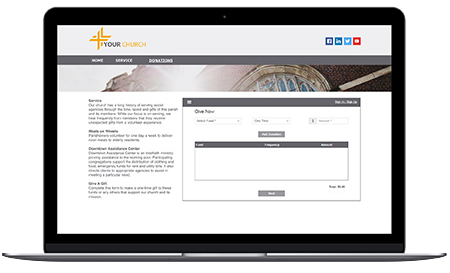 GivePlus Online allows anyone to contribute to your ministry through your website. "The online giving process through GivePlus is user friendly for both donors and administrators." "Best move we have made to help our church for increasing offertory." "Adding the convenience of a safe electronic giving option has made an important difference in our parish offertory collections." GivePlus Online is included with ALL eGiving plans. Plus, you can rely on our team of giving experts, support staff and online resources to guide you every step of the way. How easy is it to add GivePlus Online onto my church's website? You can start accepting online gifts within minutes! You either embed the donation form on your site or we can host a giving page for you. Can donors set up recurring donations? Yes. If donors have a GivePlus account or choose to create one, they can log in and select the frequency of the transaction during the donation process. If your church has multiple funds, donors can select different frequencies for each fund. How quickly are donors’ GivePlus Online gifts processed? One-time debit and credit card donations are processed immediately. ACH and recurring debit and credit donations received before 3 p.m. CT Monday — Friday will be processed that day. ACH and recurring debit/credit donations received after 3 p.m. CT on Friday will be processed the following business day. How quickly are GivePlus Online donations deposited? GivePlus Online donations are electronically deposited into your church bank account within two to four business days.